Timber windows are fantastic natural products to enhance the look and feel of your home, especially when compared to PVCu and aluminium options. When you look at how window companies are designing plastic versions that replicate the appearance of wooden windows, it is clear to see how the beauty of real wood is unrivalled. While they are not the cheapest option on the market, the aesthetics of hardwood is like nothing else, plus when probably maintained with the love and care they deserve, wooden windows can last for many years to come. Nowadays, timber windows offer a wealth of benefits and positive attributes which many homeowners enjoy throughout the Devon area and beyond. Not only offering all of the protection, security and weather performance of their aluminium and PVCu counterparts, timber windows have been developed and enhanced to ensure maximum performance across many years. For those who live in period or listed properties, the need for authentic wooden windows which complement the style and age of your home is very important. Taking into consideration all of the various rules and regulations relating to upgrading your home’s windows and what is feasible is a significant responsibility for any homeowner and should be well researched. A collection of hand selected, experienced Devon joiners are on hand to create the perfect hardwood windows for your period home and install them through their bespoke service which ensures a hassle free process, from start to finish. You only need to look at historic buildings of significant age to see how well timber windows last with proper maintenance and repairs, where necessary. Therefore, the support in regards to the outstanding beauty and long term performance of wooden windows is clear to see. And while many homeowners have a careful consideration of the environment, the sustainability argument in support of timber windows has been addressed in recent years. "Increasing the value and appeal of your period property through professional craftsmanship"
Responsible sourcing of materials, strict regulatory controls and many wooden windows now being manufactured from engineered wood options has meant the effect on the environment is very much at the forefront of people’s minds when it comes to enhancing their homes, with active steps being taken to reduce the impact on the resources available. 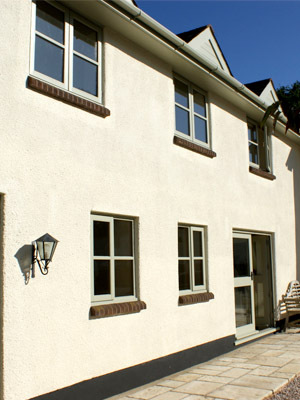 So, whether you are looking to install hardwood windows which are sympathetic to your period property, are seeking quality timber windows for new build developments or want to give your beloved Devon home the beautiful windows they deserve, our range of experienced and knowledgeable joiners are here to help. Providing high security, fantastic thermal properties and a stunning appearance, timber wooden windows are also excellent in conservation areas where traditional aesthetics are vital in the twenty first century.